Nextel phones are notoriously ugly. The company has never worried much about appearances since they were mainly intended for the construction site. They were instead more concerned about a phone that was almost mil-spec in its toughness. The good news (at least for Nextel subscribers) is that they are starting to move away from this brick phone style design, and more towards a sleeker, sexier look. The Stature really isn’t anything terribly new. 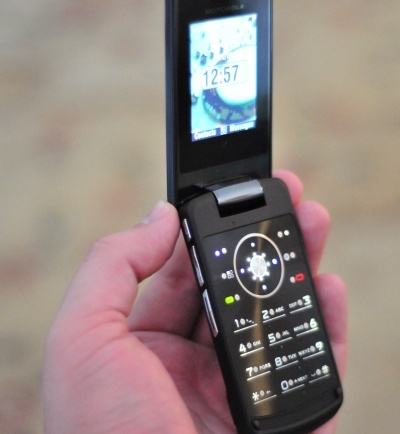 Motorola took the design of their incredibly popular RAZR2, and added the necessary electronics to use the i9 network. So while the Stature is by no means a small phone, it is thin enough to fit conveniently in your jeans pocket. The phone feels like a quality device. The back is rubberized and resists fingerprints, but still provides a firm surface to hold onto. It opens smoothly and feels very solid when you hold it up to your ear. The left side of the phone is a little busy, with the GC/DC mute button, the volume control, and the PTT button all being at the top. The bottom has the micro-USB port for charging and data transfers, however I was unable to get the phone to charge via a micro-USB cable. Instead, I had to use the standard wall charger. While this wasn’t a major issue, it could be a problem in some situations. One thing this phone does lack is a standard 1/8 inch plug. If you’re planning on using the phone as an MP3 player, you’ll have to get a USB adapter or a Bluetooth device to do so. The right side has a menu button, and a sliding lock switch which locks all the buttons on the outside of the phone. The menu button brings up one of the phone’s more interesting features, the front screen menu. The front bezel of the Stature has several touch buttons surrounding the screen. These buttons light up depending on what function you are using at a given time. The phone provides a slight vibration when you push a button, providing a slight feedback which is actually pretty nice. The front screen is quite versatile, and provides a clear display regardless of whether you are listening to music, taking pictures, or just scrolling through your contact list to call someone. Battery life is weak, frankly. Standby time is roughly 24-36 hours, and talktime is listed on the Sprint site as around 3 hours. This means you’ll have to charge the phone regularly. One of my favorite features of the phone is the sound quality. The sound on this phone is, in a word, incredible. I’ve used many phones, and this phone has the clearest sound of any phone I’ve ever heard. If you’re concerned about sound quality, that alone is a reason to buy this phone. 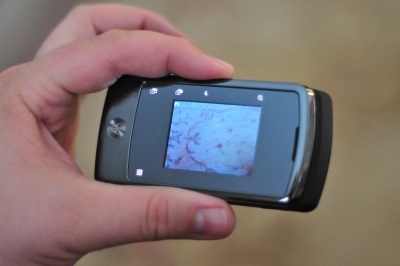 Unfortunately, there are some drawbacks with this phone. In addition to the obvious issues with battery life, because this is a Nextel phone, the network is really slow. Like painfully, agonizingly slow. Most Nextel users aren’t all about the internet browsing on their phone anyway, so you’ll have to decide for yourself how critical this issue is for you. As far as cost goes, you’re looking at $399 from Sprint without a contract, $199 with a contract, and $299 if you want to buy it from Boost Mobile. Bottom line, if you’re a Nextel user looking for a new phone, I’d say buy this one. The sound quality, style, and size more than make up for the poor battery life.